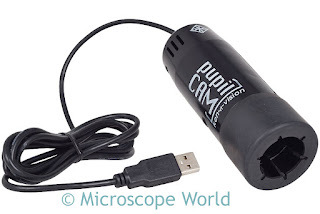 The PupilCam is a fairly inexpensive way to adapter your microscope to either a computer, TV monitor, or multimedia projector. Ken-A-Vision makes two types of PupilCam cameras - one with a rubber eyepiece adapter that fits securely over the existing microscope eyepiece, or one that includes a built-in 10x eyepiece that will replace your existing microscope eyepiece. 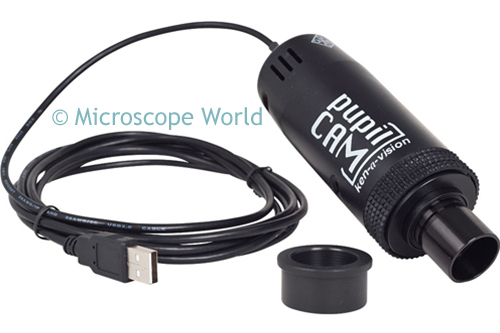 PupilCam 1400 series USB digital microscope cameras. 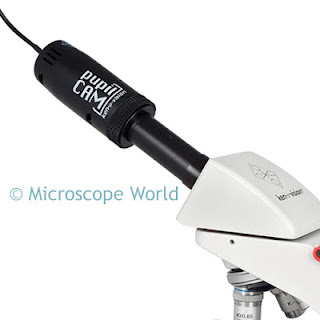 PupilCam 1400 series video cameras. Connecting the PupilCam to an existing microscope is easy.